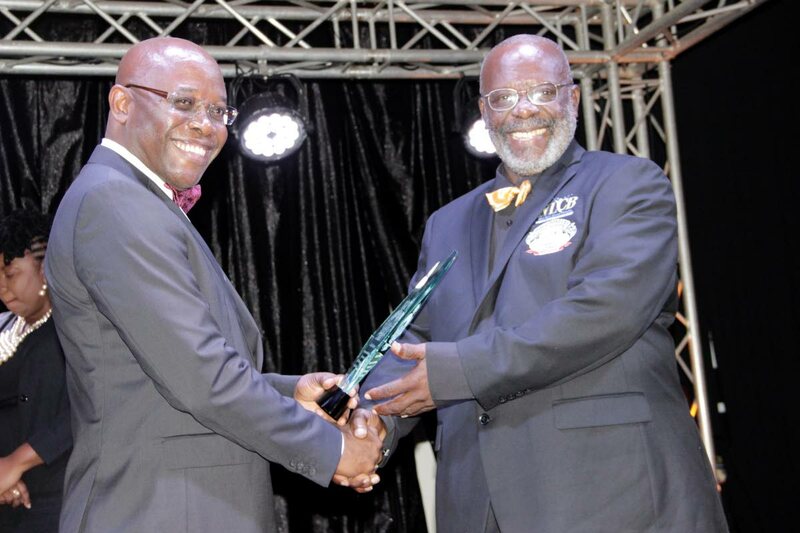 NLCB Chairman Marvin Johncilla, left, presents Charlie Murray, one of the founding members of the NLCB Buccooneers Steel Orchestra, with an award for long service at the bands 50th anniversary dinner and awards ceremony at the Magdalena Grand Beach and Golf Resort in Lowlands last Saturday. National Lotteries Control Board (NLCB) chairman Marvin Johncilla said the board will not be as free-handed with its public spending as in years gone by, now that lottery winnings will be attracting a ten per cent tax as of December 1. Johncilla, in Tobago for last Saturday’s 50th anniversary celebrations of the NLCB Buccooneers Steel Orchestra at the Magdalena Grand Gold and Beach Resort in Lowlands, said, however, that the board will not abandon these players. On the NLCB Buccooneers, he said the board’s relationship with the steel band was still going strong. “I am very proud of the milestone that the NLCB Buccooneers Steel Orchestra would have achieved,” he said. As to the band's plans to tour internationally, Johncilla said “The NLCB will be treating with each project on a case-by-case basis. I have heard of the band’s interest in travelling and once the overall financing can be obtained then we will assist. “We have a corporate social responsibility and outreach strategy. The strategy caters for arts, culture, education, sport and community development. That is some of the areas we will be pursuing and once there are very viable projects that we can partner with other interested parties here in Tobago, we will certainly do that,” he added. Reply to "NLCB to cut back on freeness"